Recently we showed you a laptop that is an attempt by a company to combine the rigidity of the past with modern looks – the ThinkPad E480. 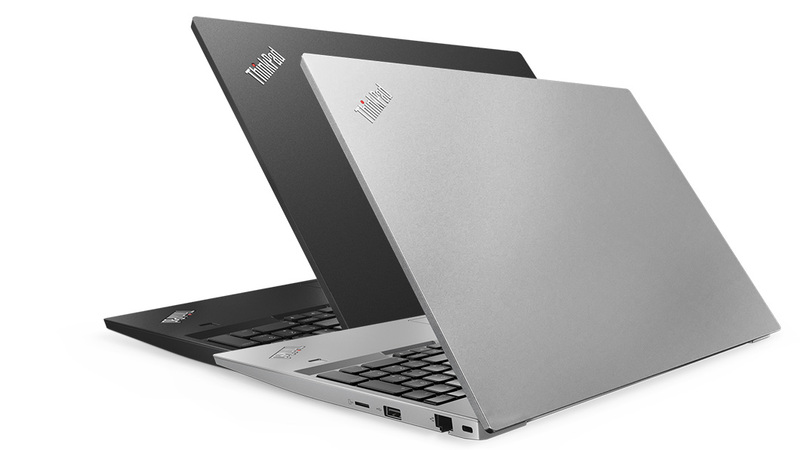 Today we are looking at essentially the same shell but in larger form factor – the 15.6-inch Lenovo ThinkPad E580. Lenovo is well known for its super sturdy ThinkPad products, dating all the way back to the IBM age. But modern times need modern methods. The old square body is not that appealing anymore. In an era of super thin MacBooks and even slimmer Dell XPS business devices, the ThinkPad series would be doomed if they didn’t change something. Okay, you are thinking why would we talk about MacBooks and XPSes when the ThinkPad E580 starts at $630. Well, because this device offers all that you need. First of all, the CPU line-up of this model is on point – ultra-low-voltage and super powerful Core i5-8250 and Core i7-8550U. Lenovo also provides the option of a dedicated Radeon RX 550 graphics card, although our review unit features only the integrated HD Graphics 620U. And one more time we want to emphasize that this model tries to offer everything you actually need in the business segment (like a fast SSD with NVMe support, for example). Lenovo ThinkPad E580 was accompanied by a 65W charging adapter as well as a bag, containing some manuals and set up guides. We have to prise Lenovo for using two huge foam pieces to protect the precious laptop from eventual kicks or drops during transportation. 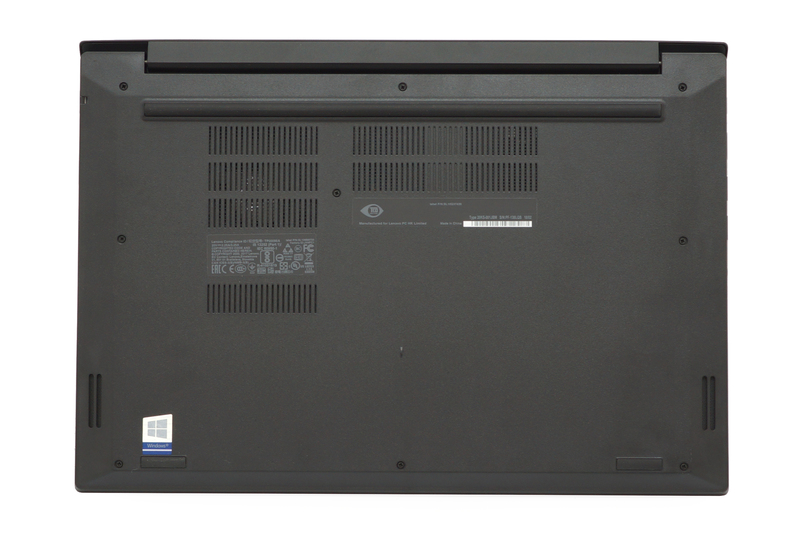 Lenovo ThinkPad E580 has a plastic design following strictly the ThinkPad model. It possesses more of a simple look, rather than being eye-catchy, but hey, the logo in the corner is 3D and the dot of the “i” letter glows red when you turn the device on. Nice details, Lenovo. This device is neither the thinnest nor the lightest but the shape is appealing to business customers. It measures at 369 x 252 x 19.95 mm (14.53″ x 9.92″ x 0.79″) and weighs 2.10 kg (4.6 lbs). Expectedly, the plastic material on top is a huge magnet for fingerprints. When you open the lid (the use of two hands is mandatory), you see a full-size keyboard, thankfully. It features adequately positioned arrow keys that spill from the usual rectangular shape of the keyboard down to the palm rest area just a little. Appart from being large enough, keys have good travel and feel super clicky which we really liked. 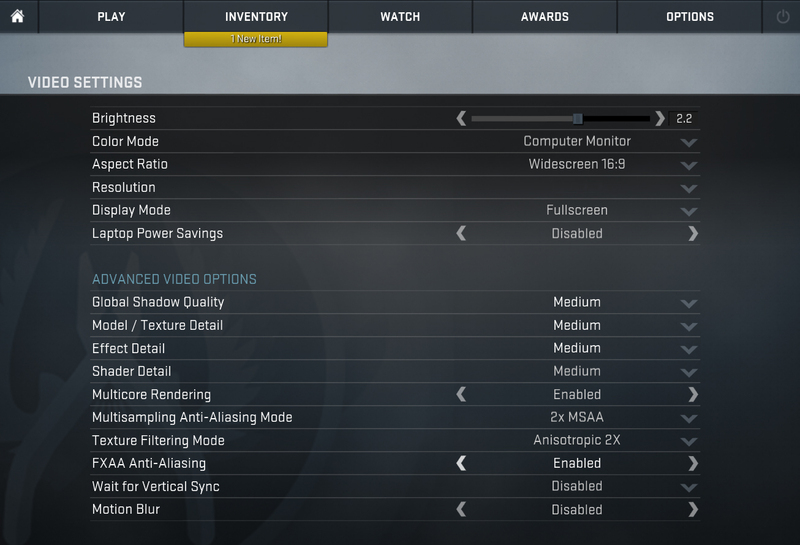 However, the decision to switch the places of the “ctrl” and “fn” buttons left us confused. So often we found ourselves mixing them that it got kind of annoying. 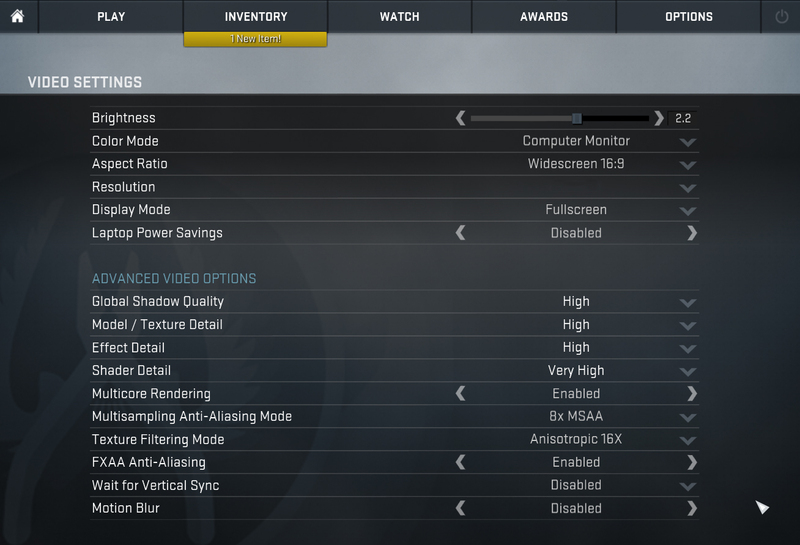 However, there is a setting in the BIOS that enables you to swap one for the other. 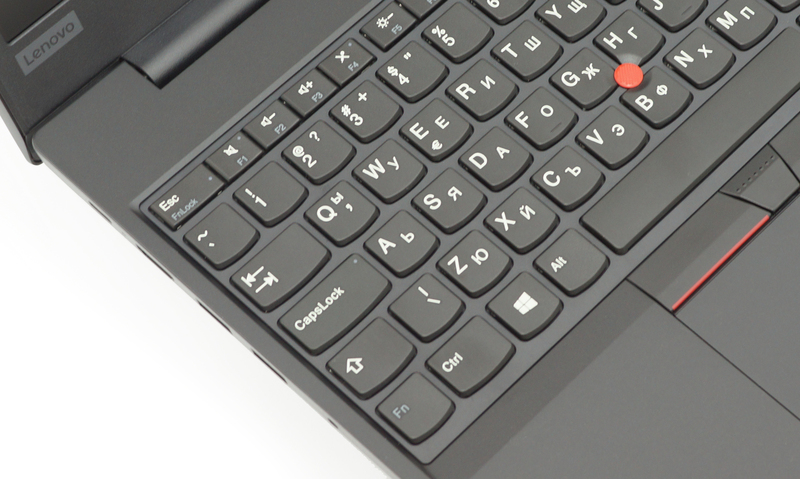 Anyhow, as usual for a ThinkPad, you can see the distinctive red “joystick” and mouse buttons on top of the touchpad, while there are also two embedded into the touchpad itself. Speaking of it, it has Windows Precision drivers and works fast and responsively. It’s not the best on the market but is actually very good for a business device. 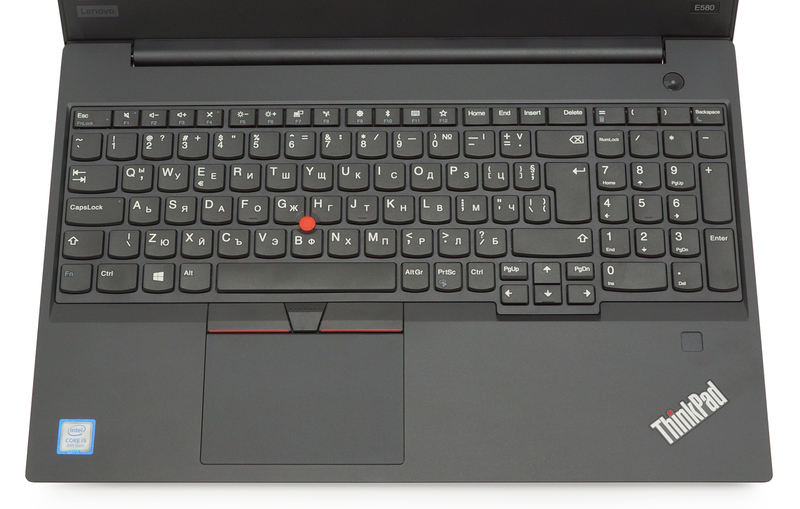 On the right, just above the ThinkPad logo (the dot of “i” letter glows again) is the location of the fingerprint reader. No matter how much you turn the device around you won’t be able to easily find the heat exhaust vents. That’s because they are hidden right at the connection between the body and the lid. This means that the sides are reserved only for I/O. On the left side, we are happy to see that a USB 3.1 Type-C port is used to charge the notebook. 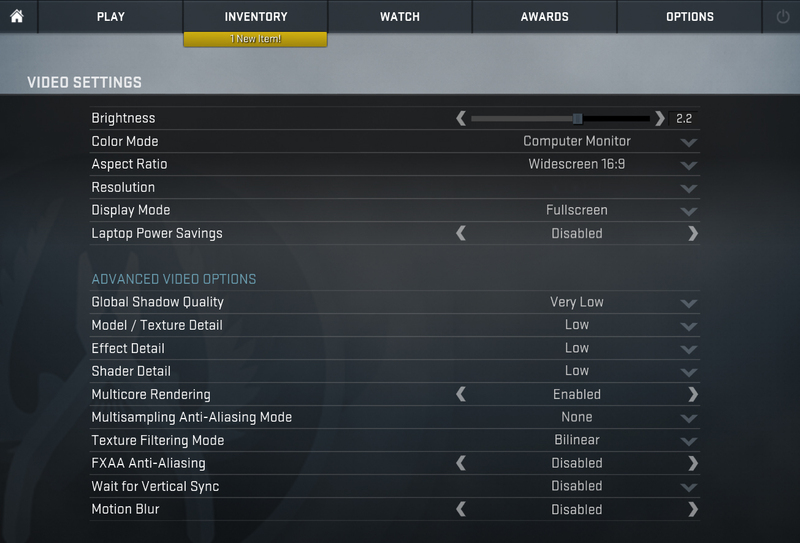 It also supports DisplayPort output. Next, we have an HDMI connector as well as two USB 3.0 Type-A ports, one of which is Always On enabled. Lastly, we got the 3.5 mm combo jack. On the other side, there are just the Ethernet connector, one USB 2.0 Type-A port, and a Micro SD card reader. 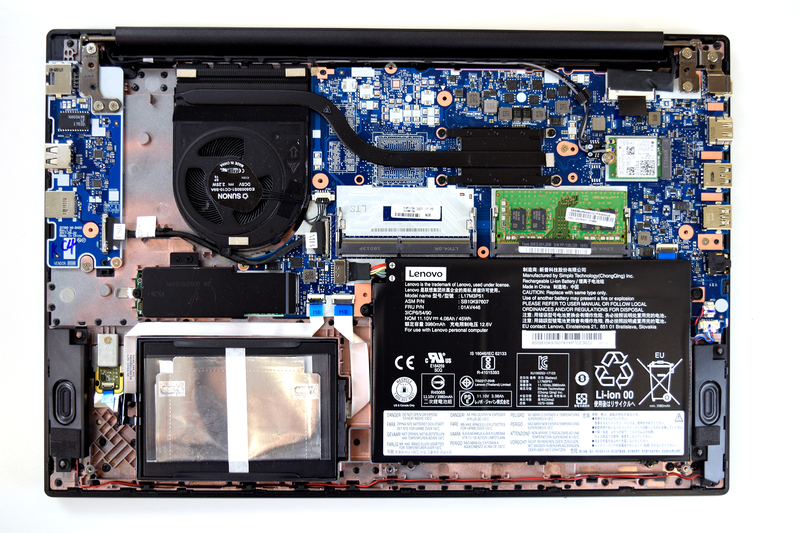 It is fairly easy to get inside the Lenovo ThinkPad E580 because you are 9 screws away from its guts. Once you unscrew them and carefully pry open the bottom panel, you are going to see a pretty regular package. The Intel Core i5-8250U is cooled by a single heatpipe, while the heat is blown out by a medium sized fan. It’s not super effective, but given the ULV nature of the CPU, you won’t need more. 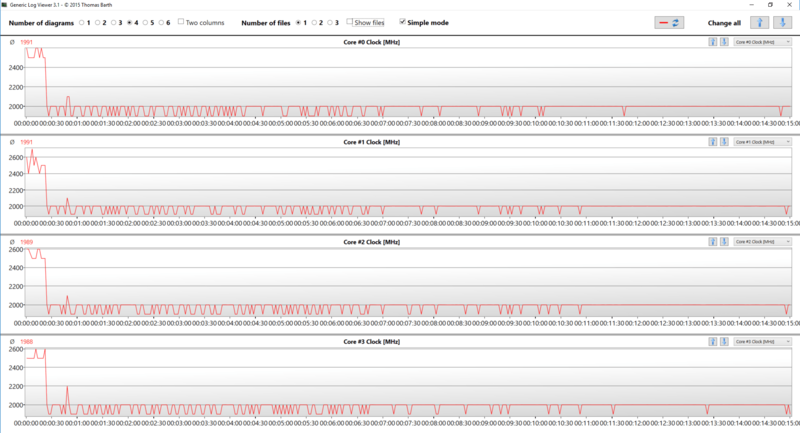 Very close to the CPU is where two RAM DIMMs are located. They support up to 32 GB of DDR4 memory and as you can see in our case one of them is free. On the right, you can see the tiny Intel made Wi-Fi adapter. 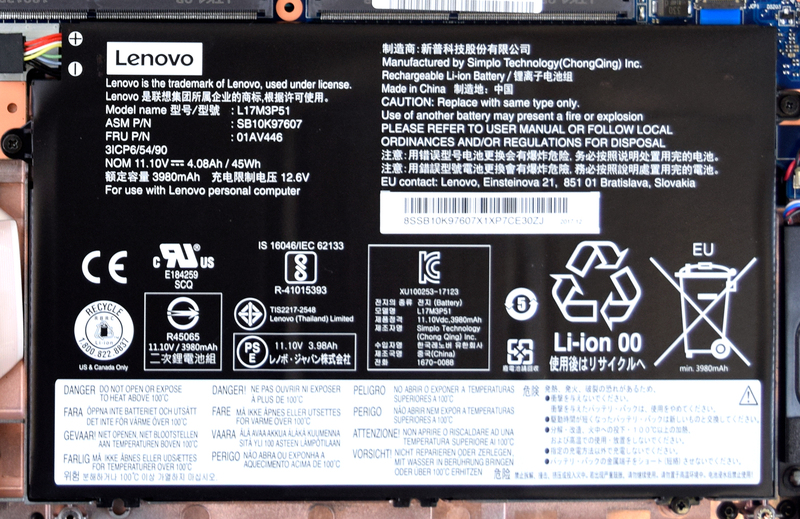 Further down you can see the 45Wh battery with its three-cell clearly visible through the black protective material. 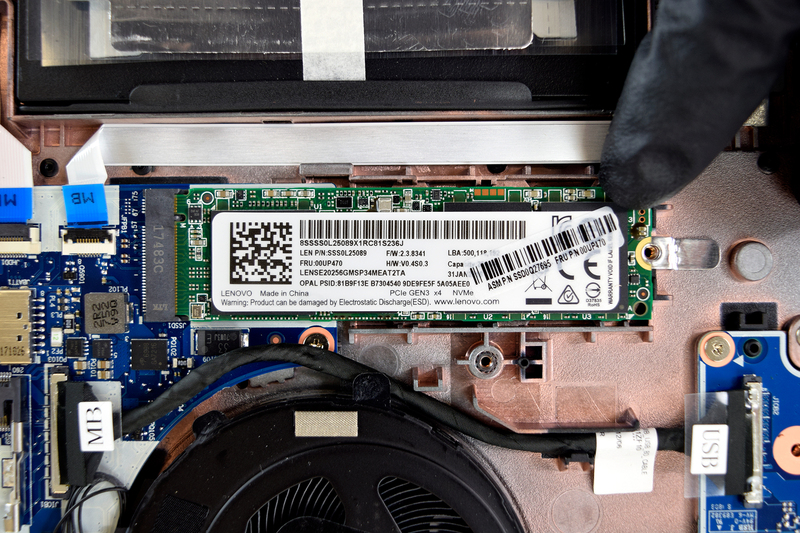 Here you can see a fast PCIe NVMe SSD actually manufactured by Lenovo themselves. It bears a model number of LENSE20256GMSP34MEAT2TA and has a capacity of 256 GB. We weren’t able to find a lot of information about it on the Internet but you can check the Read and Write speeds we tested in the “Storage performance” part of this review. However, keep in mind that it’s common for storage devices to be region dependent so don’t be mad at your retailer if the unit you receive lacks this specific drive. Lenovo ThinkPad E580 has a Full HD (1920×1080) IPS panel with 15.6-inch diagonal, a pixel density of 142 ppi and 0.18 x 0.18 mm pixel pitch. The panel has a model number NV156FHM-N49 and can be considered as “Retina” when viewed from at least 60 cm. Viewing angles on this device are excellent. We recorded a peak brightness of 276 nits in the center of the screen and 261 nits as an average across the surface. The maximum deviation is 16% in the bottom right corner. The correlated color temperature at maximum brightness and white screen is 6000K – just a tad warmer than the sRGB standard of 6500K. The image gets even warmer along the grey scale – 5850K. You can see how these values change at 140 nits (71% brightness) in the image below. This display is able to reproduce only 50% of the sRGB color gamut, meaning that image will neither be very saturated, nor vibrant. We test the reaction time of the pixels with the usual “black-to-white” and “white-to-black” method from 10% to 90% and the other way around. We recorded Fall Time + Rise Time = 33 ms – far from the fastest on the market, but okay for an IPS panel. Our tools were able to detect PWM adjustment at all brightness levels except the maximum one. However, the frequency of the pulsations was high enough, so they are not that harmful. The screen fit on Lenovo ThinkPad E580 suits the business nature of the device perfectly. As expected from an IPS panel, it has good viewing angles at superb contrast ratio. While default settings are adequate, there are some setbacks. One of them is the modest color coverage and another one is the unacceptably high deviation of luminance in the lower right corner. There is also a presence of PWM in all brightness levels, except the maximum. And although those pulsations are with very high frequency, you can completely eliminate this threat by installing or Health-Guard profile. Lenovo ThinkPad E580’s sound is loud and clear. The low and mid frequencies have some deviations, while the highs are good. As always, the battery tests were run with Windows power saving setting and Wi-Fi turned on, and the screen brightness adjusted to 120 nits. As we said earlier, this unit is equipped with a 45Wh battery, which at first glance may not sound a lot but it gave exceptional results. It got us through 9 hours and 36 minutes of web browsing and 8 hours and 25 minutes of video playback. However, you can only get around two hours of gaming, although we doubt you are going to do so away from the plug. Here you can see an approximate comparison between the CPUs that can be found in the Lenovo ThinkPad E580 models on the market. This way you can decide for yourself which Lenovo ThinkPad E580 model is the best bang for your buck. Here you can see an approximate comparison between the GPUs that can be found in the Lenovo ThinkPad E580 models on the market. This way you can decide for yourself which Lenovo ThinkPad E580 model is the best bang for your buck. 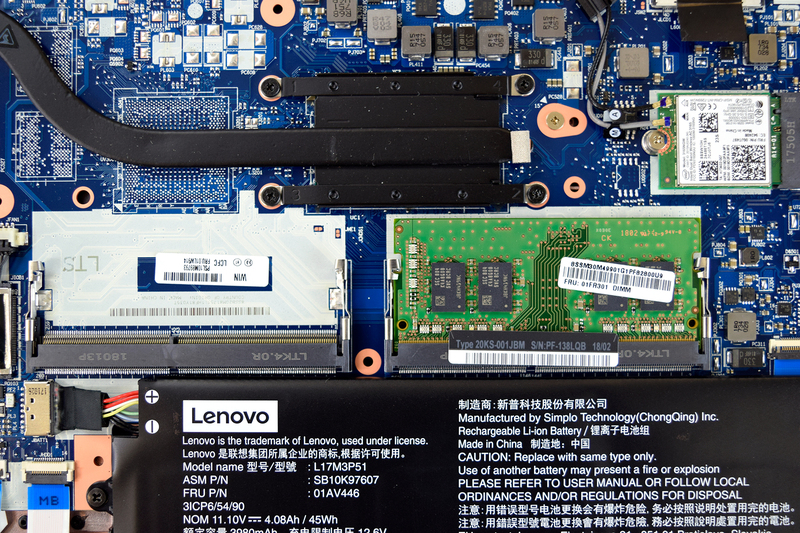 Lenovo put its own in-house Lenovo AM6671 M.2 2280 256GB NVMe PCIe SSD. This unit achieved up to 1774.0 MB/s Read speeds and 1041.2 MB/s Write speeds, which is impressive, but normal for an NVMe device. Despite the bravery of the Intel HD Graphics 620 inside this business notebook, it didn’t impress us at all. 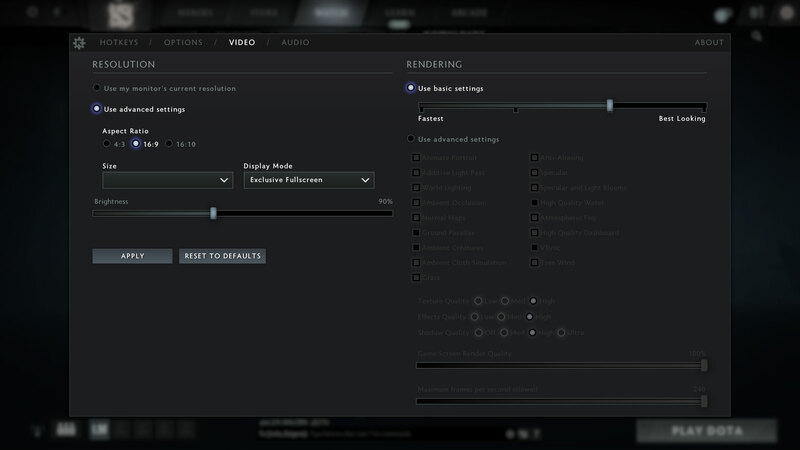 Still, you can turn down the resolution and also give up some good looking textures if you really want to play titles such as CS:GO and DOTA 2. However, GTA V is terra incognita for this device. Lenovo ThinkPad E580 in the configuration we use is equipped with Intel Core i5-8250U, which in this case idles at 37C. It started well at 2.5 – 2.6 GHz until around the end of the first measurement frequencies slumped to 1.9 GHz. 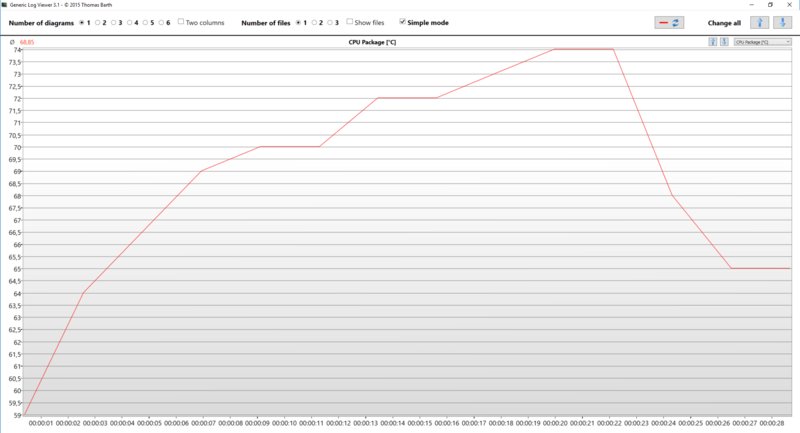 This coincided with the CPU package reaching 74C. The single fan on this device remained relatively quiet even when temperatures forced the frequencies to drop. After that for the whole remaining period of the second checkpoint clock speeds were stable at around 2.0 GHz, while temperatures were in the range between 60 and 64C. 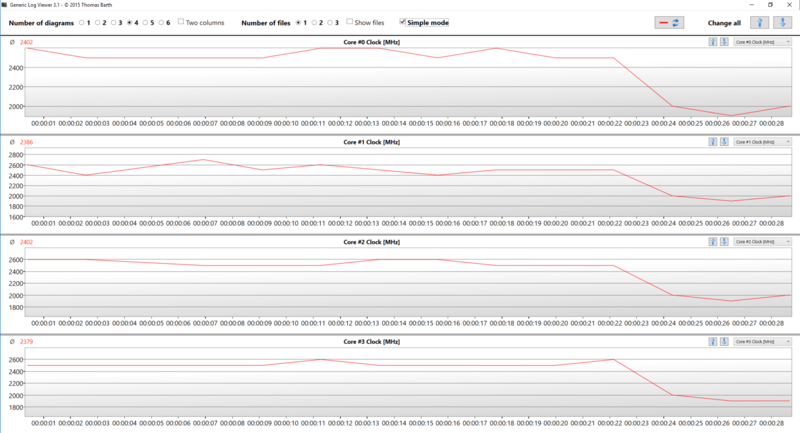 Until the end of the test, we saw some fluctuations in the frequencies of the cores from 2.0 to 1.9 GHz and back again. 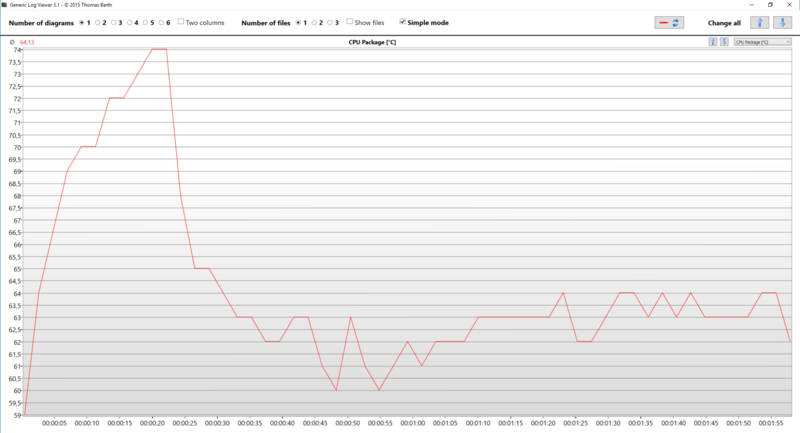 Although from the 7th minute they established at 2.0 GHz for the rest of the torture. Temperature-wise, a little gradual increase to 69C at the end. We are satisfied with this result as this temperature is a pretty stable one, especially at these extreme conditions. This means that even if you render a video on this laptop, you won’t get it to sweat at all. We want to note that the Lenovo ThinkPad E580 wasn’t loud at all, even when 15 minutes of Prime95 torture have passed. Surface temperatures were highest in the top left corner at 42C, while the hottest part of the keyboard area was in the middle. However, this will not be a problem as in regular use rarely saw ThinkPad E580 heating up and moreover, the palm rest area remained super cool at all times. Business laptops aren’t meant just to stay in the office and be connected to a couple of monitors or a dock, or whatever. They are meant to be taken to meetings, in the plane, at home or even at the coffee shop. They are defined by versatility and the best in the class are good all-rounders. Not only that but a business device represents its owner, hence it has to give a sense of authority. 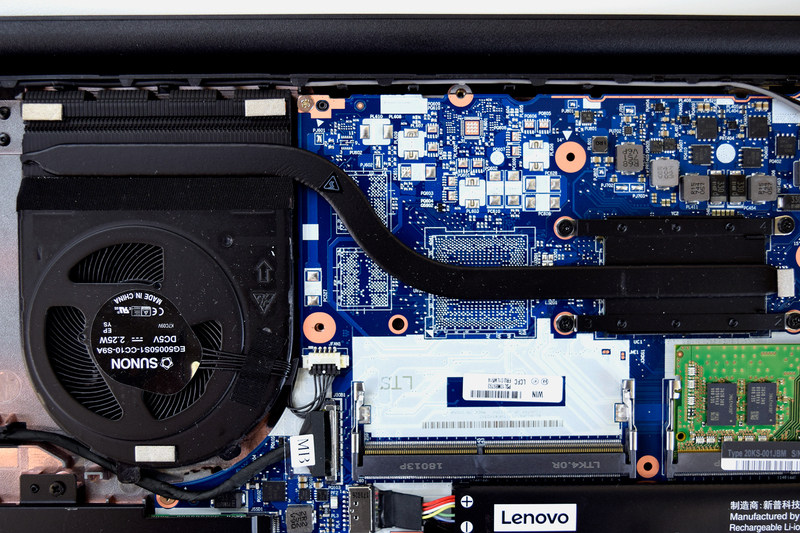 Although build solely from plastic, the Lenovo ThinkPad E580 is sturdy enough to give a feel of reliability, and the ThinkPad signature makes it recognizable. However, when we talk about style, we would be happier if we saw an aluminum body as in the case of Acer Swift 3, for example. 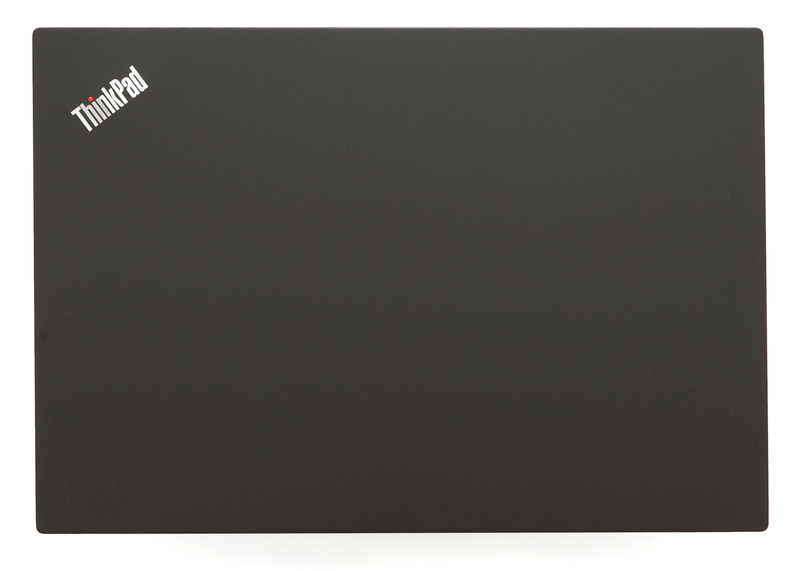 Performance-wise, we were impressed by the capabilities of this notebook. 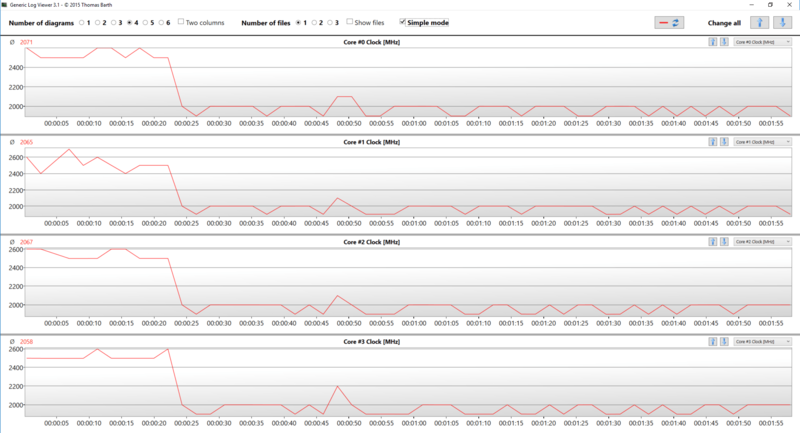 There was not a single time that the system lagged or failed to perform swiftly. This is mainly thanks to the Core i5-8250U processor and Lenovo’s in-house PCIe NVMe SSD, which boasts about 4 times faster Read and 2 times faster Write speeds than a casual SSD. Moreover, we noticed that in raw benchmarks and in some games this computer is able to get everything from its ultra-low-voltage CPU. An area in which ThinkPads are usually strong is input devices. The keyboard has a perfect design for typing with fast feedback, long enough travel and relatively large key size. However, if you are not familiar with the series you’ll need a couple of days adjusting to the switch of the “function” and “control” keys. Earlier we said that a perfect business device should be a perfect all-rounder. Well, the ThinkPad E580 is capable of almost everything. You can even enjoy some light gaming if you opt for the dedicated Radeon RX 550 GPU. Also, you can enjoy a long enough battery life thanks to the 45Wh battery and ULV processor. Lenovo promises around 13 hours of battery life, which is possible only if you turn on the computer and not use it at all. What we got was around 9 hours and a half of web surfing, 8 hours and a half of video playback and just under two hours of gaming, which is a very good result still. This is a huge improvement over last year’s ThinkPad E570. Finally, we got the screen. Lenovo used an IPS panel but to cut costs even further they used a budget one. This results in only 50% coverage of sRGB color gamut and PWM used for all brightness levels except the maximum. However, latter can be fixed with our Health-Guard profile. All in all, there is nothing else we can really complain about and moreover, we definitely recommend this business device. poly carbonate and plastic , seriously…I got one from germany with i7 , i think its aluminum , with MIL-STD-810G military certification.